Today the 22nd Trans Sport Show opens to the public and fans at the SMX Convention Center. Yes, as the name of the event suggests, the show is on its 22nd year. It's already been that long, and has always been part of the past and younger generations. Considered as the longest running motor show in the country, 22 Years is no joke! Wait there's more. If you want to relive and be with classic cars then your wish already came true. It ain't complete without the classic cars that we grew up with and feel nostalgic once you have them on your side. 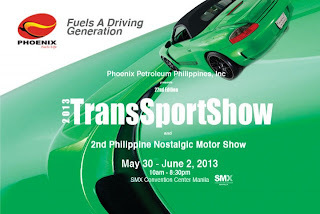 TSS 2013 specially features the 2nd Philippine Nostalgic Motor Show. A show within a show, now how cool is that!!! -P50 for children aged three to 12. There are different booths and kiosks there to let you choose from car parts and accessories, to fan shirts, car restoration, to GPS devices and car alarms. So bring the whole barangay. Expect a lot of Porsche's in the building as they celebrate 50 Years of the Porsche 911. Be part of their history as you go to each one of them. Don't forget to visit the Phoenix and Shark booth. They will be rockin' the joint together with their hot and gorgeous models. Don't be shy and have your pictures taken with them, after all it's always the fun and giggly part. Tag them after, to show the pictures you've taken and to also to show your support. The Trans Sports Show 2013 is presented by Phoenix Petroleum Philippines, Inc.